This post is the second in a series of tutorials that will help you learn how to use the Stock Inspector software. 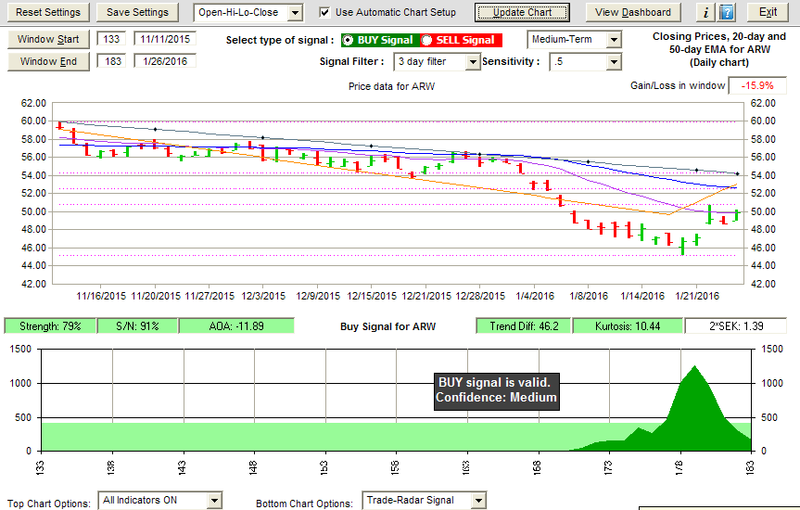 Today's tutorial is all about identifying Buy and Sell signals to help guide your stock trading strategies. First, here is an overview of today's topic. Trade-Radar Stock Inspector does many things but it is primarily intended to generate either BUY signals or SELL signals. A signal implies an event; in this case, a reversal in stock prices. Using the Chart screen, you can have the software evaluate recent price action and determine if there is an upside breakout (a BUY signal) or a downside breakout (a SELL signal) taking place. You can further verify the validity of the signal by reviewing the various indicators on the Dashboard. These signals can be useful for trend traders, momentum traders, bottom fishers, short sellers or anyone who is interested in price reversals. Start by entering a stock symbol and downloading price/volume data and financial data. For details on how to do that, please take a look at Tutorial #1 - Loading Data. Essentially, just click the "Load data from Yahoo" button (it's the middle button in the following image) and go from there. To get to our signals, we have to start the chart engine. After loading data, just click the "View Buy-Sell Signals" button. This will cause the chart screen appear. This when the cool stuff starts happening. The chart engine's default setting is to automatically look for Buy signals. So there is no real need for you, the user, to fiddle around with any controls in order to get started. The chart engine will attempt to find the Buy signal and will zero in on the part of the chart that is showing that positive reversal in prices. Take a look at the screen shot below. There are four main sections to this chart. The top section contains various controls that allow you to manipulate the chart if you feel the need. The second section is a standard price chart with two kinds of trend lines, two moving averages and Fibonacci levels superimposed. The third section displays a chart of the signal and the fourth, bottom section provides controls that provide more options for populating the two chart sections. Let's get into each section in a bit more detail. One reason this product has the Trade Radar name is because when it identifies what it considers to be a valid signal (either a Buy or Sell signal) it will always generate a signal with the peaked kind of shape as shown in the dark green color in the screenshot above. This shape reminds me of what a tracking radar might display to indicate it was locked on with a strong signal. Signals that are not valid will not have that well-defined peaked shape; they will be flatter and messier looking. Ideally, the graph should be nearly flat across the period of interest with the exception of a tall, skinny peak at the point where prices are exhibiting a potential reversal. Note that the signal is dark green. This means it is a valid signal. Signals that are borderline would be in a yellow color and signals that are clearly invalid would be red. The next thing to notice is the black box just to the left of the signal. 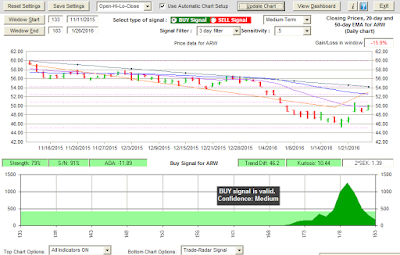 It states that the Buy signal is valid and that the software has further determined that "Confidence is high". In other words, this appears to be a strong signal that can be relied upon. Note that you can drag the black box left or right if you wish if it happens to be covering something you want to see. You will notice that there is a horizontal, light green band along the bottom of the signal chart. This can be thought of as sort of a threshold. When the signal rises above the light green band and then falls back down into the light green band, then there is a good chance that the signal has enough of a peaked shape as to be valid. Finally, there is a set of numeric indicators along the top of the Signal chart section. These indicators display some, though not all, of the calculated values that the software used to evaluate the validity of the signal. They are provided simply so you can see some of the characteristics of the signal, if you are interested. Note that when an indicator's background color is green, it means the calculated value supports the validity of the signal. Yellow would mean borderline and reddish would mean the value definitely does not support validity. I mentioned above that our signal, the tall, skinny peak, typically occurs in the vicinity of where prices are exhibiting a reversal. Sure enough, in the screen shot above, you can see the price decline, hit bottom and then start moving up. At certain point in the upswing, the software has decided that the reversal is real and declares a valid Buy signal. To help you visualize what the software is seeing, there are two connected orange lines that track the price action. These are called the Slope lines. In the screenshot above, one of the Slope lines corresponds to the down-trend and the next one corresponds to the new up-trend. Note that they are connected at the bottom; ie, where the lowest closing price occurred. The angles of the trend lines are an important part of the process when determining the validity of a signal. There is also a standard trend line that, in the case of Buy signals, attempts to connect the price peaks. It can be useful to see when the new up-trend breaks above the trend line. Of course, it would be the opposite for a Sell signal. The blue line is the 50-day exponential moving average and the purple line is the 20-day exponential moving average. You can use these lines to see when price rises above or falls below these lines or when the lines themselves cross. Finally, the magenta dashed lines are the Fibonacci retracements lines. They are set up to capture the highest and lowest points within the window of data being displayed and then calculate the various retracement levels in between. If you happen to use Fibonacci analysis in your trading, these are for you. So far in this tutorial series, we have explored how to load data into the program and then how to easily check for Buy or Sell signals. Note that in the example above, we are displaying a signal based on daily data. You can just as easily base your signals on weekly or monthly data. This is actually more appropriate for those investors who are not such active traders. In the next post, I will continue discussing the chart screen and get into how to use the various controls in order to adjust the graphs to make the trend line more accurate, how to include more trading days or reduce the number of trading days, etc. I will also show you how to display trading volume, Bollinger Bands, MACD, Stochastics and many more. Be sure to come back for the next few posts. Once we get through the all the information related to the charts, we can get into the Stock Inspector Dashboard. That is where you will really see the benefits and uniqueness of the Stock Inspector software. Trade-Radar Stock Inspector will work just fine on Windows 7, Windows 8 and Windows 10; however, you might need to adjust Compatibility settings before running the install. Get the details by reading this blog post. Receive notification when new TradeRadar software updates are available, get latest stock picks, market calls and commentary. I am passionate about the Internet, dedicated to following and understanding the stock market, find writing software and developing web sites fascinating and I enjoy tasting wine. I have been trading stocks for more than 20 years with various degrees of success. I have a political science degree, an engineering degree and an MBA. I have worked in aerospace-defense as a software engineer, in IT consulting and most recently in IT management for a large financial services firm. I have a decent grasp of mathematics, I still enjoy writing code, I never tire of following the stock market and I enjoy the occasional glass of wine.